Mountain Horse Ladies Stylish Fashion Melaine Stretch Tech Breeches Full Seat. SKU : MH 05259 MELANIE TECH BRCH #AE. The Melanie Tech Breeches from Mountain Horse are sporty riding breeches made of a technical stretch fabric. With a new colour blocking design for a great look and Mountain Horse triangle grip technology that provides extra grip in the saddle, these breeches are comfortable, practical and stylish. With two zip pockets at the front of the breech and a shiny branded button, this breech looks good while feeling great too. A wonderful addition to your wardrobe. 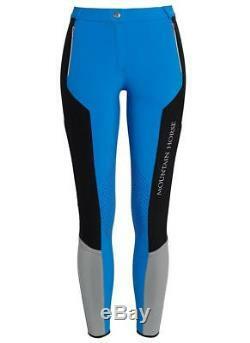 Sporty riding breeches made of a technical stretch fabric. A new colour blocking design for a great look. Mountain Horse triangle grip technology. These breeches are comfortable, practical and stylish. Two zip pockets at the front of the breech and a shiny branded button. Extra Grip in the Saddle. Please include your filled in return slip with any package. If there is any intentional damage to the box including sellotape, writing or stickers we reserve the right to reject your return. Please just bag the item up, even if its a simple black plastic bag. Please send us images of the item as a whole and the specific areas of damage and we will advise you how to proceed. This can at times take up to 14 days. Your item may not always be available in our main warehouse and we will need to get the item from our secondary warehouse. This may take several days. 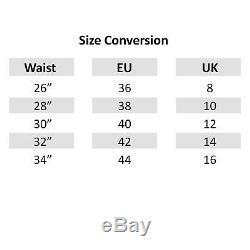 If an item is not available we will contact you regarding an alternative. Please note dispatch estimates, if the items are coming from a secondary warehouse we will need more time to dispatch them. The UK costs are as follows. The following postcodes are exempt: BT, JE, GY, PO, IM, IV, KW, PH, PA, AB 37-9, AB 38-9, AB 55 4, HS, ZE AND TR 21-25. Please message us for a quote. Tack n Hack are a family company based in Manchester, England. Specialists in Equestrian wear they have been life-long lovers of horses and riding. Starting small, they have slowly used their passion for the sport to build a business, dedicating their lives to what they love and helping others discover the joy of equestrianism. Tack n Hack wants to provide all the equipment to treat your horse right and to keep you safe in the saddle. With a huge warehouse of stock in Manchester, we are getting new ranges in stock all the time and keep at the cutting edge of the latest brands and styles for your stables! The item "Mountain Horse Ladies Stylish Fashion Melaine Stretch Tech Breeches Full Seat" is in sale since Tuesday, March 27, 2018.